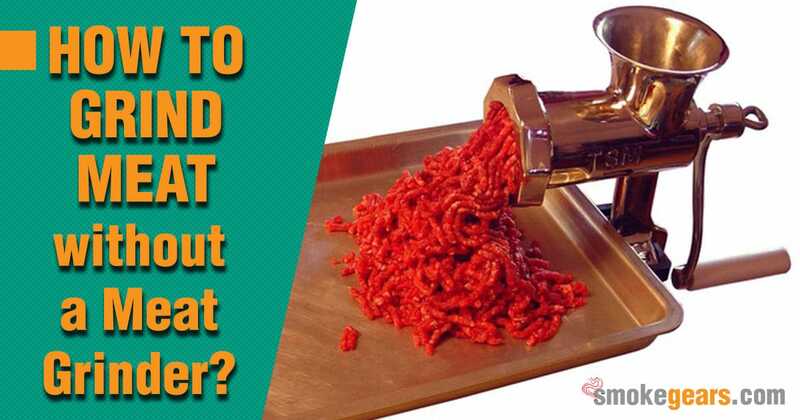 →How to Grind Meat Without a Meat Grinder? I used to buy grinded meats directly from the supermarket and cook that. I preferred that as I didn’t have a meat grinder at my home. But one day one of my friends invited me for the dinner and there I came to know that she grinds the meat on her own that too without a meat grinder. I was amazed and couldn’t resist myself to ask her how to grind meat without a meat grinder! This is because it tastes better than the grinded meats available in the supermarket and also they are much cleaner and also can be customized according to my needs and preferences. So, when I learn how I can grind the meats without using a grinder I was so happy. I decided that I will definitely try it at home and I did. It completely satisfied me. So, I thought to share this with you so that you can also grind the meats at home even if you do not have a grinder. It will definitely have better taste and cleaner than the ones available in the market. You can grind the best meats in two ways even if you don’t have a grinder. One is with the help of a food processor and another is with the help of hands. Ground meats are useful in various dishes and you can cook it in many ways. But the better thing about grinding it yourself rather than buying the ground meats already available in the supermarket is that you can grind the way you like. You can grind it in several types. Whether you like coarser texture or a finer texture, you can get it exactly the one with the help of the food processor. All you need is a food processor which can help you to grind the meats. Even if you do not have the food processor, then go old-school. Use your hands to chop the meats. Read on to know more about the processes and the pros and cons of both the processes too. How to Grind Meats Using The Food Processor? The easiest and fastest way is using the food processor. You will be amazed to see that food processor can do a lot of job for you. Grinding meats is also a lot easier with the help of this processor. If you have a food processor at home then it is the best and easiest alternative of a grinder or even the packaged-meat from the supermarket. You have to cut all the meats into cubes of 1 inch. This will make the grinding process a lot easier and smoother. You need to freeze the meat before you start grinding in a single layer. Make sure you freeze it until the edges and corners of the meats are stiff and pliable in the middle. Also, freeze the blades of the food processor. When you start grinding make sure to fill half of the food processor with meats. So, you may need to work in batches. Once your meats are ready to be grinded, you can start it. Start the food processor to grind the meat but make sure not to over-process the meat. The ground meat you will make in the food processor will not look same like that of the meat you will buy from the store. This will have a coarser like texture or meat crumbles. You should not continue the processing until it become paste. It will have a better taste if it stays coarsely-chopped meat. So, this is how to grind meat without a grinder in the easiest way. How To Grind Meats Using Your Hands? When I asked my friend, how to grind meat without a grinder as well as food processor, her answer was Hands. It is as simple as that! It is one of the best ways to grind the meats just like the way you want. This can also help you to get a workout for you. This is a traditional way which was used years back when there was no food processor or grinders. Cutting the meats with hands is a good way to get some ground meats that will taste awesome. You have to cool the meat and knife first. So, you need to store them in the freezer for at least 15 minutes. You have to then organize your cutting into thin slices just the way you want. Once you start chopping, you have to maintain a consistent width throughout to get the best result. Keep the meet on a platform and then start chopping from left to right, first. When it is done, start chopping from top to bottom keeping the knife in a perpendicular way to the previous left to right cuts. Keep on chopping unless and until all the meat is chopped finely and in the perfect consistency exactly like the way you want. The best thing about this is that the control is completely at your hands. Whether you want finely chopped meats or coarsely chopped, you can get it. Perfectly chopped meats like the way you want. Texture may vary which is really good when cooked. No need to clean the blades and utensils. Better taste of the meat than the food processor. So, if you are also buying ground meats from the supermarket regularly then this is the high time to ditch it and apply this DIY (Do It Yourself) methods. If you wanted the same but wondering how to grind meat without a meat grinder, then you have probably got the answer. With the help of these two processes you will be able to grind the meats yourself at your home. You will not need a meat grinder for this and also you will no longer have to buy the processed meats available in the stores. Grinding meats at home even give you better flavour of the meat and customized texture and shape. If you have a meat grinder, read How to Sharpen Meat Grinder Blades? This article will help you a lot.